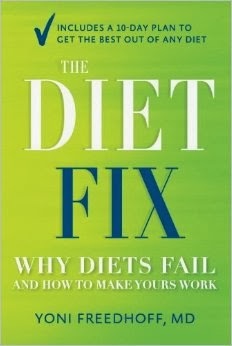 It's hard to believe but in less than 3 weeks The Diet Fix will be on shelves, and just yesterday a Q&A I did with Amazon about it went live and happily Amazon has no issue with me sharing it here. What is Post Traumatic Dieting Disorder? Post-traumatic dieting disorder or PTDD is the frequent consequence of years of recurrent traumatic dieting efforts. It’s a shared constellation of symptoms that often extends far beyond a dieter’s relationship with food and may include feelings of ineffectiveness, shame, hopelessness, loss of healthy body image, feeling permanently damaged, social withdrawal, and, at times, can even impact upon interpersonal relationships. Another very common symptom of PTDD is the belief that traumatic diets are required for weight management success; oftentimes folks with PTDD spend huge portions of their lives yo-yo’ing from one traumatic diet to the next. This leads to a vicious cycle of suffering, binge dieting, and feelings of inadequacy that sets people up for failure. Why is the label of obesity misleading? Unfortunately the label “obesity” carries with it a huge amount of societal stigma, stereotype and frankly ugly judgment whereby people who are described as “being” obese are regularly perceived and portrayed as lazy and gluttonous. Yet the presence or absence of weight really doesn’t define anyone. There are healthy people with weight to lose, and unhealthy skinny ones, and I certainly know plenty of beanpole gluttons. While there’s no doubt that medical risk rises with weight, risks are certainly not guarantees, and more importantly, weight does not and cannot be used to judge a person’s lifestyle. So if you’re ever writing about obesity, remember that a person cannot “be” labeled as obese, they can only have obesity, and that given the negative stereotypes and implications surrounding the word obesity, that distinction matters. What is the biggest misconception you wish people could shake off about dieting? The biggest misconception that I wish people could shake off about dieting is that suffering and sacrifice are dieting’s true determinants of success. Unfortunately, as a species, we just aren’t built to suffer in perpetuity. Consequently, weight that’s lost through suffering, through some combination of under-eating and/or over-exercising, is bound to come back. There really is no one “best” diet - if there were, there wouldn’t be tens of thousands of different diet books available, and weight struggles would be rare to non-existent. Ultimately a person’s “best” diet is the healthiest diet that they can enjoy, as diets that are merely tolerable, given food’s star billing as one of life’s most seminal pleasures, simply don’t last. Real life does, and frankly must, still include chocolate.